This subject equipment is a versatile, computer controlled Photoluminescence Spectrometer. It incorporates 8.3-watt, pulsed xenon for fluorescence and phosphorescence decay time measurements. The instrument works on electronic and vibrational changes of electroactive species or molecules from the ground electronic state to the excited state of higher electronic energy. The excitation is in the range of 200 – 800 nm and emission is 200 – 800 nm with zero order selectable. Standard PMT covers 200 – 650 nm; R928 or R956 PMT available for full range. Synchronous scanning with constant wavelength or frequency difference is included. The excitation spectra are automatically corrected. The slit widths are of fixed dimensions (10nm). Scan speeds can be selected in 1nm increment from 10 – 1500 nm/minute. 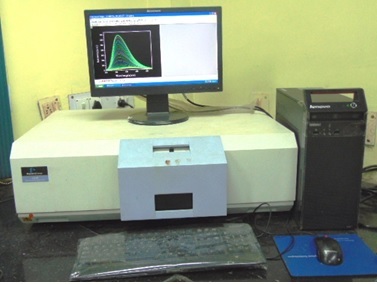 In this premiere Institute this instrument will be extensively used to analyse the photoemissive properties of the samples for basic and applied research work. It is used for determining the fluorescence interaction of the toxic metal ions, anions (like fluoride, cyanide etc. ), explosive pollutant and nitroaromatics (epNACs) with the developed sensor molecule.